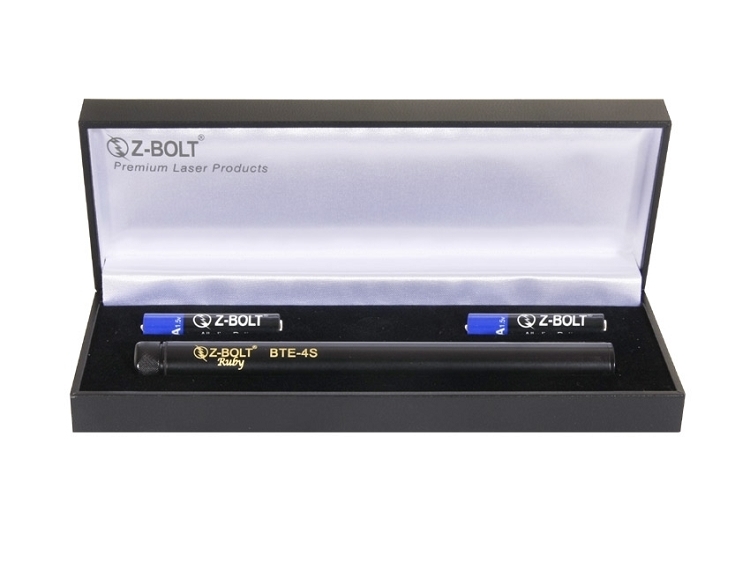 The Z-Bolt® BTE-4S is a 635nm red laser pointer with constant-on switch. Brightest FDA Power. Solid brass construction; black finish. Engraveable. Hands free operation. Premium gift case. Text or Logo Engraving? :Please Email Us for Special Red Laser Engraving Orders . . . The red laser module in the BTE-4S operates on 2 pcs AAA batteries for superior battery life - forty (40) hours constant on operation. Ships in satin lined carry case. Power controlled with constant on/off lick switch. Operate hands free.